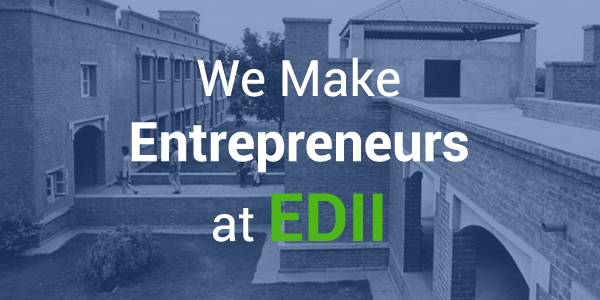 The Entrepreneurship Development Institute of India was set up in 1983 in Ahmedabad, Gujarat. It is a not-for-profit institute and currently offers various management programmes including the PGDM-DS to encourage entrepreneurship development and development studies in the country. This is course is way ahead of the MHRM (Masters in Human Resource Management) courses run by various universities as it equips students with the skills and techniques required to work in various development works. The PGDM- DS or Post Graduate Diploma in Management – Development Studies is one of the flagship programmes of the Entrepreneurship Development Institute of India (EDII). It is a multi-disciplinary programme that has been specially designed in order to provide conceptual and analytical skills along with the knowledge required for economic and social development. The main aim of this programme is to provide students with opportunities to develop entrepreneurial solutions to poverty and low level of livelihood, to think of new initiatives for corporate social responsibility and to help build up the economy through entrepreneurship. All graduate students with 50% and above in graduation and who have the required CAT/XAT/CMAT/MAT/ATMA scores are eligible to apply for this course. Through this PGDM-DS programme, the EDII is trying to encourage students to specialise in diverse fields like micro finance, social entrepreneurship, fund raising, development research, micro enterprise development, gender studies, urban and rural livelihoods and corporate social responsibility. The academic curriculum is intellectually invigorating and through its innovative methods of teaching, specialist faculty and unique training and development programmes, the EDII has been enabling students to venture into rewarding professions with various organisations. Some of them are playing a big role in Corporate Social Responsibility wings of multi-national corporations, United Nation organisations efforts involved in urban and rural development, grant making organisations and various Not-for-profit organisations. Graduates from our PGDM-DS programme are in demand due to their specialized knowledge of development studies and how to create social initiatives that will help the urban and rural poor. 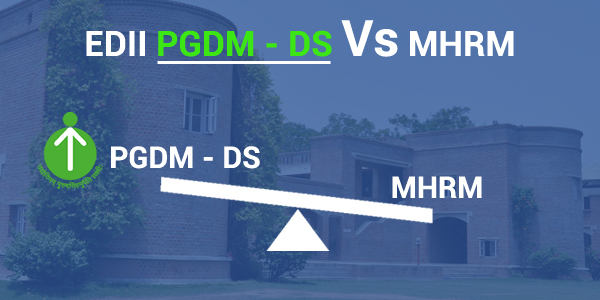 Why PGDM-DS is better than an MHRM programme? PGDM – Development Studies is a programme which is classified under the category of social sciences. It is ranked amongst the most popular management programmes because many regions of the world require specialists in development studies. It focuses on training students to work in the political, social and economic sectors. Part of the curriculum of this programme is studying development policies that have shaped the society we live in. Once a student graduates from the PGDM-DS programme, he or she will have a unique awareness and understanding of the society as it is today. An MHRM or Masters in Human Resource Management degree will only provide you with the skills to pursue a career in Human Resource management. It will not equip you with a valuable entry path into national and international development work. The PGDM-DS programme is a value added course which will provide you with technical knowledge, skills and hands-on field experience. The Mission Swachh Bharat can lead to large number of new and innovative entrepreneurial opportunities for both existing and start-up entrepreneurs throughout the country. Launched on a war footing, the campaign is India’s biggest drive for sanitation and availability of potable water. These sectors are now set to be the catalyst to the next wave of entrepreneurship. Practicing the 5R principle of “reduce, reuse, recycle, recreate and recover” could spin off multiple benefits like job creation, resource use reduction, and health, hygiene and income enhancement by entrepreneurial activities. 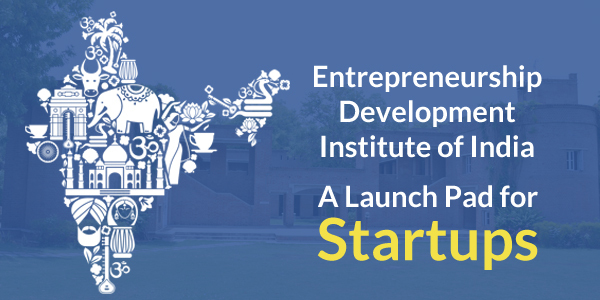 In this regard, The Entrepreneurship Development Institute of India has organised half day seminar at EDI campus, Gandhinagar. 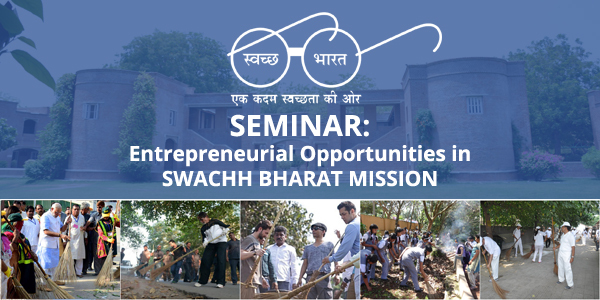 The objective of the seminar is to sensitise the entrepreneurs and work out viable and cost effective business opportunities emerging from the Mission Swachh Bharat launched by the Govt. of India. Hence it is important to important to identify the type and quantity of wastes to build enterprises and transform them into wealth. The theme of the presentation and discussions in the seminar aims to focus on cost effective, appropriate and viable technologies and equipment to convert WASTE INTO WEALTH, and explore the data and information to identify the huge business opportunities in all industrial sectors and accordingly work out viable business plans. • Government’s Scheme for entrepreneurs. • Techno-commercial viability of processing waste to convert them into marketable products. • Appropriate technology and equipment for wastes processing and their sources. • Start-up Opportunities under Swachhta Udyami Yojana. • Treatment of Solid Waste. • New Innovations, innovative products and advancements in sanitation and hygiene. The seminar shall be beneficial to existing and new entrepreneurs searching innovative business opportunities, to policy and decision makers from the Industry and Government, NGOs, business consultants, academicians, business schools ED cells, students and all the stakeholders of society. The best way that one can give back to their country is by starting businesses that would add to the country’s growing economy. Although having a family-owned business comes with all the same responsibilities and concerns that public companies have to deal with, the former case is seen as more desirable as you and your family are likely to have greater monopoly over the entire situation. 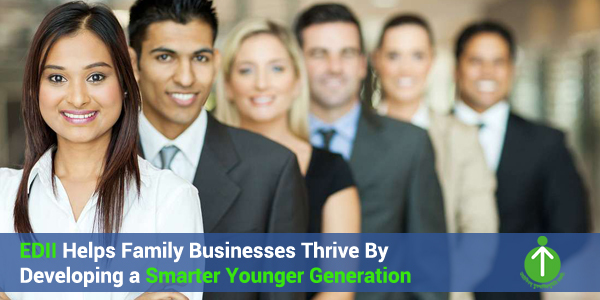 Most family-owned businesses have their roots in the joint family system. In India, every family-owned business is always striving to improve their growth and bring about a certain amount of professionalism to the job. However, by keeping with the changes in technology and developing trends, family-owned businesses have witnessed a growth in the past year and are foreseeing a 50% increase in bullish growth. A majority of families follow a line of succession that is based on age so while two-thirds of family businesses already have plans of succession in place, only 15% of them will actually help improve the business play. This is because apart from not being documented, the rest are not robust at all. The only good part is that a very large majority of family businesses in India, about 75 percent, have a well-established mechanism in place to deal with all kinds of conflict. About 90% of Indian businesses are said to be family-owned. It has been found that the contribution of family owned businesses to the domestic economy has been far more than that of the public sector or even of multi-national companies. About 50% of the businesses that are listed on the National Stock Exchange indexes are family-owned. Hence, the progress of the Indian economy is closely intertwined with that of family-owned businesses. With a little aid and assistance in improving their strategies, family-businesses will soon become major contributors of the country’s Gross Domestic Product. 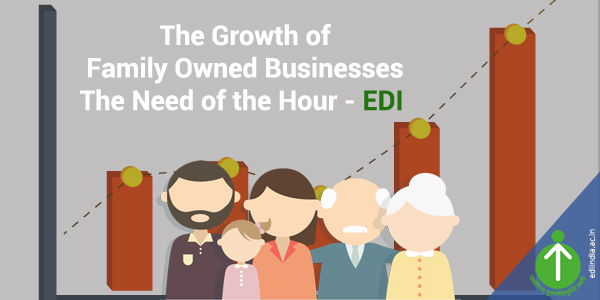 Family-owned businesses do face a few challenges when it comes to their growth structure. The most important is the stiff competition that arises when you decide to take your business to an international level. Apart from this, succession plans may also cause a significant amount of damage to your increasing growth structure as the new generation may not have the knack of tackling the various business-related issues. So unless you start to professionalize your management strategy, diversify your leadership strategies so that your business can witness better growth, you will not be able to reach very far. At EDI, we have a well-structured syllabus that deals with all aspects pertaining to entrepreneurship education and development. We provide opportunities for you to engage in collaborative research with well-known personalities that have made a name for themselves in their own spheres. By brushing you through the various strategies for rural and urban entrepreneurship, you will certainly have an advantage when you choose to start a family-owned business. With an academic fraternity that will train you in the different trends that affect businesses, you will be exposed to the various limitations that you are likely to encounter while embarking on this venture and will also learn how best you can deal with them. 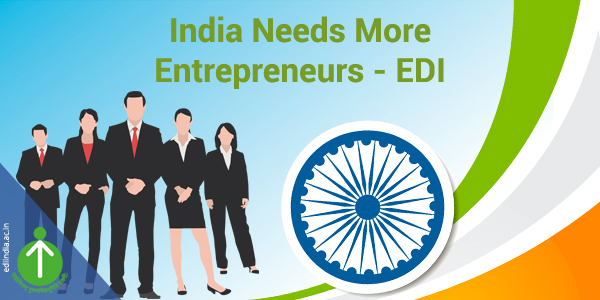 So join EDI and let us open up the world of business to you so that you emerge a success. 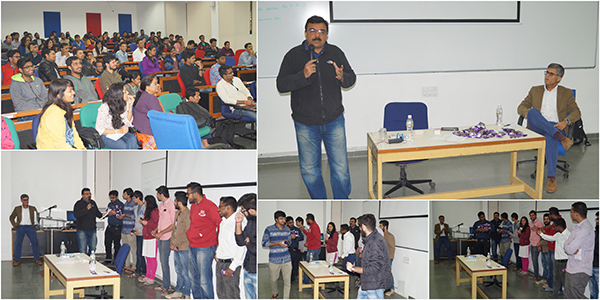 We thank Mr Prabhat Agarwal and Mr Sandeep Sachdeva, for sharing the journey of their social entrepreneurship ventures, Janta Meals and Safe-in-India, with us. Your practical (and happy) explanation of unequal distribution of wealth and its impact on the world was persuasive and inspiring. The lecture cajoled, touched many hearts, alleviated some fears and led to a shift in perception about social ventures. Their stories of Indian and International social ventures were highly instructive and messages contagious. Beginnings with identifying a problem that can be solved for the benefit of the society, creating a sustainable business model and working towards technical and non-technical solutions needed by the huge scale opportunity that India offers. Their practical examples debunked the myth that an organisation cannot make profits keeping social good in mind. Clearly, everyone who wants to make a difference need not always be company founders. We need hundreds to manage such organizations, advocate for them, lead their technological innovations and get involved in all aspects of their business models.